With Imbolg upon us-the time of beginnings and fresh starts-let us look to the maiden aspect of the Goddess:Brigit. Known also as Brighid, Bridget, Brigid, Brigandu in Brittany(Northwestern France), Brigantia in England, and Bride in Scotland, the Catholic church renamed Her St. Brigid and held this manifestation of the Goddess in high honor unitl only recently. Imbolg is commonly called St. Brigid's Day in the mundane world and celebrated the day before Imbolg, on February 1. Brigit was embraced most by the Celtic Irish, and is one of the few Pagan deities to survive well in modern times. In Ireland, her popularity rivals that of St. Patrick. 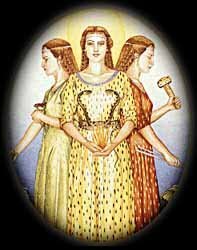 Known as the Triple Goddess, Brigit is Goddess of poetry and inspiration, Goddess of healing and medicine, and Goddess of smithcraft. This makes Her a most well-rounded deity: not only can She bring home the bacon and fry it up in a pan, Brigit banged out that iron skillet, can bandage up any burns you got stoking the fire and compose a little ditty to make you forget the pain! Poets worshiped Her. The metered writing was known as "the fire in the head" so it is natural that Brigit became their leader. Perhaps She is the muse all writers turn to when inspiration is needed. As the Goddess of Healing, Brigit embraces midwifery and herbalism. St. Brigid was rumored to midwife the Virgin Mary. The Goddess is said to be present at every birth. With her tri-fold nature, the number three is sacred to Brigit. Blackberries are sacred to Her. in many Celtic traditions, it's customary to pour out the first drink of home brew in honor of Brigit, who also takes on the duties of patron Goddess of Brewing. Brigit reigns in the South, no surprise for the Goddess of the smithies. Called "Bright Arrow" "Ashless Flame", and "The Bright One", She is a warrior with a penchance for arrows and spears. Legend is Brigit's sunrise birth brought fire into the home and tamed it. She holds household fire sacred. In juxtaposition to her fiery nature, it is theorized that Sulis-Goddess of the Springs-is an aspect of Brigit. "Sul" is Celtic for both "sun" and "eye". Scalloped shells are linked with Brigit. Many wells in ancient times were named after Brigit. Today, Her influence remains, though many wellsprings were renamed St. Brigid. Toss a coin into a fountain and think of this Goddess. For a casual, and fun, homage to the Goddess Brigit, why not relax in the healing waters of a local hot springs, such as Idaho Springs? Or plan a holiday in Glenwood Springs. Wash away any regrets and anger in the healing mineral baths. Let your creativity burst free in song or poem as the heated water surrounds you. Cleanse yourself of your disapointments and imperfections and let Brigit guide you toward the life you want to live. Afterwards, treat yourself to a glass of blackberry wine, or a slice of blackberry pie. Heather, sage, rosehips, asheleaf, hazel leaf, chamomile, benzoin or dragons blood. Warm slowly on low heat in an enamel pan. Let cool and then place in small corked bottles. Charge in a circle and then wear or use to anoint candles.